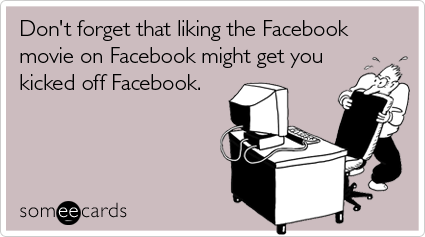 A tongue-in-cheek e-card from Someecards.com poking fun at Facebook's dismay with The Social Network, right. For many companies, a presence on Facebook is indispensable. They recognize the value of social media in building brand awareness, consumer interaction, and (if done right) consumer trust. However, some companies have also come up with innovative ideas for monetizing their presence on platforms such as Facebook. Back in June, Disney created a Facebook application called Disney Tickets Together that allowed users to purchase tickets to Toy Story 3 and invite their friends along to the same show (read about it here). It was an interesting and creative idea, though Disney does not seem to have used the app to promote any other movies, despite having a new feature film, Secretariat, set for release in the U.S. next week. Other companies sell (hopefully) large quantities of branded virtual goods for small amounts of money, known as microtransactions. These items, often purchased for about $1 each can be displayed on a user’s page within the applicable social media platform. In this regard, it not only generates some revenue, but also exhibits the user’s support of the brand and creates brand impressions with people within the user’s network. Merely using social media to build brand awareness and consumer brand impressions is certainly valuable. Finding innovative ways to monetize the brand’s offerings through social media is invaluable. The Disney Tickets Together app seemed a natural extension of a key feature of Facebook: telling Friends what you are doing and inviting them along. Consumers are wary of efforts that don’t feel genuine. Regardless of the social media platform a brand chooses to leverage, the key to success is maintaining an organic feel to the program.